A campaign folder is a grouping of campaigns. This feature helps to better organize sent campaigns and is instrumental in improving the efficiency of accessing them. Any email sent without an associated Campaign Folder is placed within the Default Folder. Other default folders that comes with ContactPigeon are Archive (where all archived campaigns reside) and My Templates (if you have marked any campaign to be a template, they will sit here). Step 1. 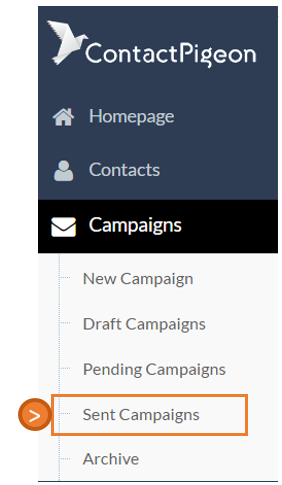 From the left side menu options, select Campaigns > Sent Campaigns. This brings up a list of all sent or cancelled campaigns. Step 2. Select the drop down menu from Folders. This reveals all existing folders. To create a new custom folder, select the "-New folder" option. Step 3. This brings up a prompt to give a name for your folder. Enter the name, and click "OK". This will generate a new folder. Select the drop down menu of the folders list again to verify that the campaign folder has been successfully created. Step 1. Return back to the sent campaigns. Locate the campaign you would like to be categorized. Click on the " Move to Folder" button to the right of campaign. Step 2. In the pop up form, select the destination (target) folder you would like the select campaign to be moved to. This function also allows you to archive a campaign by "Move to archive or save a favorite campaign template by "Move to custom templates" directly. Step 1. Go to Campaigns > Sent Campaigns. 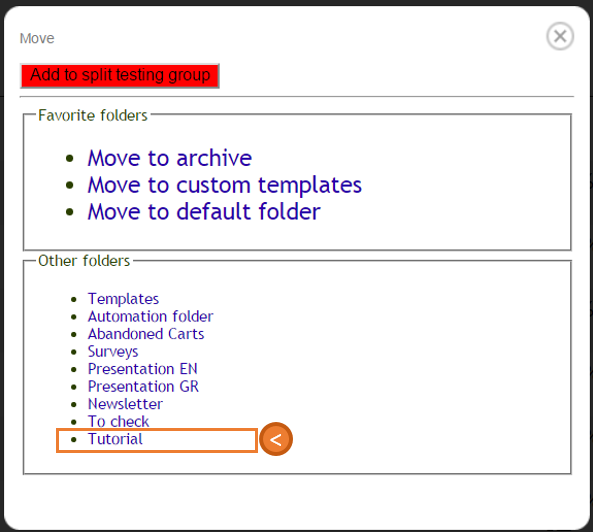 From the Folders drop down menu, select the folder you would like to modify or delete. This brings up all the campaigns within this folder. Step 2. Scroll to the bottom of the page. Here you will find options to edit folder name or delete the folder. To Edit: Change the name of the folder by directly typing into the textbox. Click "Save" to confirm. To Delete: Click "Delete". -- This action is NOT REVERSIBLE. Please note: Deleting a Folder does not remove the sent campaign. For record archival, sent campaign cannot be deleted. You can choose to archive the message instead. Once a folder has been deleted, all sent campaigns within the folder will return to the Default folder.